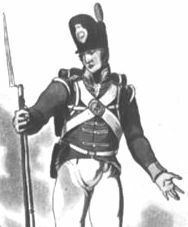 Before its heroics under the Duke of Wellington in the Peninsular War, the British army was barely tolerated by the general population. While filled with men from all parts of society, recruitment mainly came from the lower classes. Men trying to avoid prison, seeking adventure, or escaping unemployment and poverty sought the King's Shilling. The army offered men a home and a family of sorts and with strict discipline forged them into a honed weapon of war that went on to become one of the greatest military forces ever to take the field. Undefeated on the battlefield, the British redcoats took on the best Europe could throw at them and, if disciplined volley fire did not see them off, then the bayonet charge would.